So here's an embarrassing confession: As much as I adore Dragon Age, unfortunately my innate horrific lack of direction means that I still get lost IN THE MAIN HALL. Every time. I mean, how many words have I written about Solas's romance? But if you asked me where his quarters were, I'd say, second on the right upon entry into the great hall. And... I am wrong. Every time. I just can't seem to get it right. And I have similar mental blocks about plenty of other Skyhold locations. And since I blog about Dragon Age as well as writing fanfiction, this comically means I am CONSTANTLY jumping in and out of the game simply to remind myself of precisely where people are. Yeah. This is... it's pretty humiliating. I've only been playing the same game for, oh, THREE YEARS? 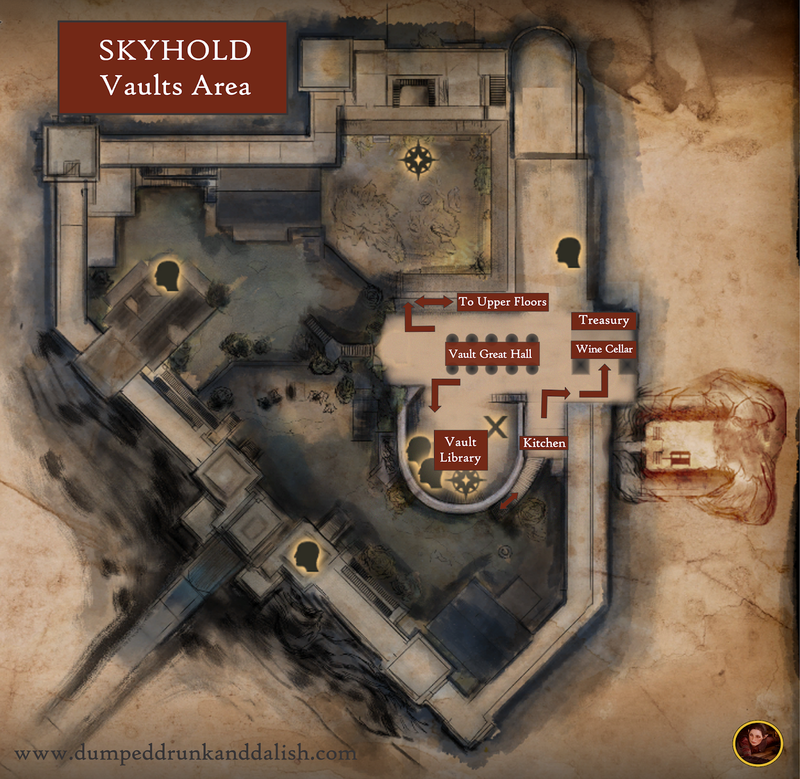 But finally here, I have rallied my Merrill inner-self and created something I simply couldn't find (which is where most of my blog post ideas come from): An ultimate guide to Skyhold. And believe me, I've Googled! So here's my take. 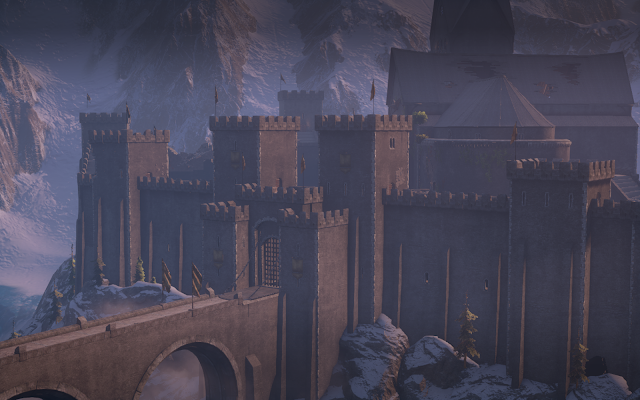 Luckily, it was incredibly fun (and easy) to do this, because the Keep designed by the BioWare team was so beautiful, huge and comprehensive. So here goes! Rejoice! Or throw things at me. Really, it's your choice. But I hope this may prove useful to many Dragon Age fans, so here's hoping. 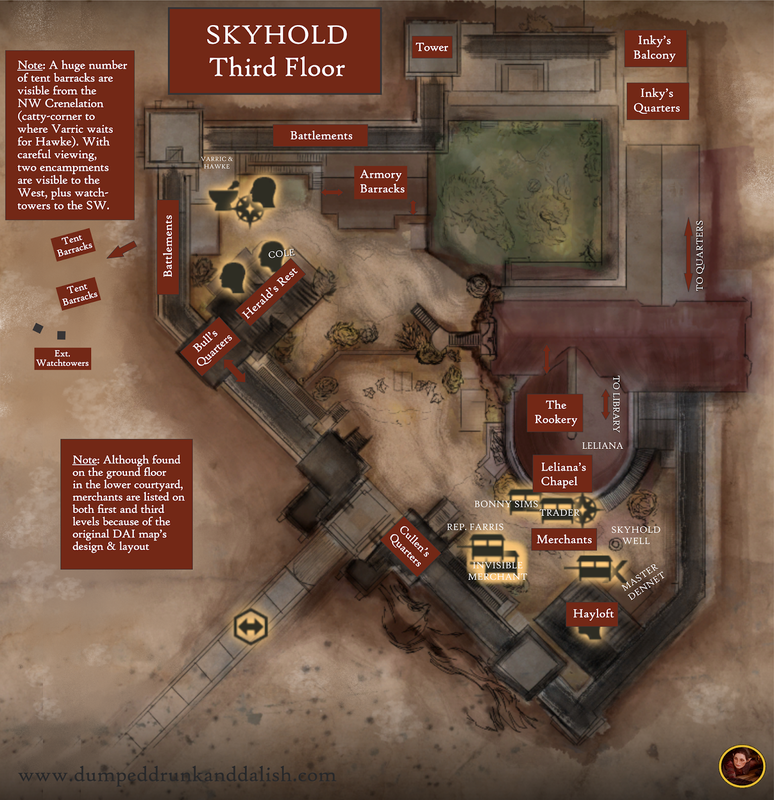 Let's recap: When we first get to Skyhold, there's definitely a need for some housecleaning. While in good overall condition, the castle is pretty decrepit. 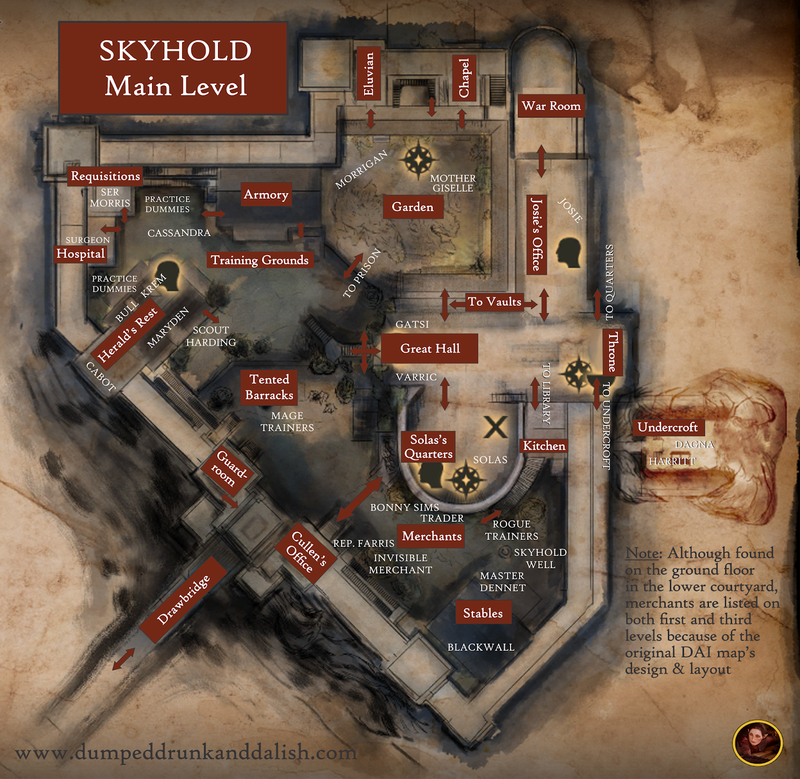 In the following maps, I've attempted to really, truly and definitively map ALL of our beautiful and much-adored Skyhold. I've done a little subtle Photoshopping on the maps here and there (primarily to make the Undercroft visible on all levels, simply for structural reasons), but not much—most of it isn't fancy, and is accomplished simply in hopes that I'm providing a more detailed and clear way to find your way around, to explore the game with ease, and to reference it clearly. UPDATE (4/18): Cullen's office has this weird aspect because it's actually not on a ground floor, but in this case it qualifies because there's apparently nothing underneath. UPDATE (4/18): Please note that I've corrected Sera's room location and moved Cole to the 3rd floor. UPDATE (4/18): Please note that I've corrected Cole's location and proper floor placement. EDITED TO ADD: Please note the updates in the image above. The third level is especially interesting because, as readers Lady Iolanthe and Erica Nichole pointed out, there is a huge tent barracks on both sides of the frozen river to the West. Slightly Southwest, within the circle of the peaks, we an also see individual standing watchtowers (please excuse me as I instantly flash on the fabulous lighting of the beacons moment from The Lord of the Rings: The Return of the King—don't judge me). It's a terrific detail I had not only omitted, I've never even seen that view until they alerted me to it! I love how many beautiful details this game provides. There's always something new to discover. Thanks to Joy M., I also fixed Sera and Cole's placement in the Herald's Rest. Since I use the "Always Night at Skyhold" mod, I've lightened and brightened this a bit, which detracts from the picture quality, but on the other hand, you can clearly see the Inquisition encampments on both sides of the frozen river below, as well as the watchtowers marching off to the left. It's a great detail I would have missed (thank you, readers!). UPDATE (4/18): Please note the expanded prison space, which literally drops off in the rear due to that massive ancient foundation-area explosion (Veil raising? ), as well as the relocation of the Treasury to what should now be the correct spot (behind the painting at the end of the Vault Great hall). One of the most surprising conundrums I had here was trying to match up the Inquisitor's quarters with the entry below them off the Great Hall, because, well... they don't seem to match up. Because once we enter, we are immediately shown as being substantially to the Northwest of where we were (and yet, still not far from the Great Hall entrance). Is Skyhold also like the inside of the TARDIS, and bigger on the inside? Hey, nothing would surprise me. Inquiring minds! Also, as my final and most burning question: Unlike Dragon Age II, however, we see NO SIGN of the privy, so... WHERE ARE THE BATHROOMS? (Note: I was kidding here, but I did love this detail in Dragon Age II—as for me, I hypothesize that Skyhold could possibly have some rudimentary plumbing (which has been around in our world since before the Romans, after all), and that mages could then make quick work out of the need for hot water from there. And where are the quarters for the rest of the army and inhabitants? Off in those tented encampments? They'd certainly make for brutal living (and I imagine the residents would rotate in and out of Skyhold due to those frigid conditions). Meanwhile, as best I can quantify, the named aspects of the map offer lodging for approximately 20 additional people. Obviously, Skyhold in fact houses many more people than this. I headcanon this as simply being due to the fact that there's far more of Skyhold than we see. Which I get—the design team did an AMAZING job of creating what we see in as much detail as we get! I'm guessing it probably holds 100 residents easily, and 200 at a pinch. The little mysterious elements still get me. Who lives in the upper room with the bow on the dresser? Who lives in the quarters with the fascinating (possibly Chasind or Avvar) antler-thing on the chest? Why isn't anyone fixing up the numerous still-decrepit guardrooms and quarters across Skyhold? And—first and foremost—why is that freaking gap still there almost two years later in that hallway to the War Table?! Why doesn't Cullen ever fix his roof? If you revisit the "Advisors surprise Bull & Inky en flagrante" scene, it's very clear exactly where the scene takes place—the room with the ax in the headboard, top the Herald's Rest. This has reluctantly convinced me that it is, in fact, where Bull probably sleeps. Although I still think he'd be neater than that. Sure, I think he'd have an ax in the footboard, but I also think his military/Qunari training would make him neater and more precise in general because those are also less revealing on a personal level. But what do you think? Did I miss anything here? 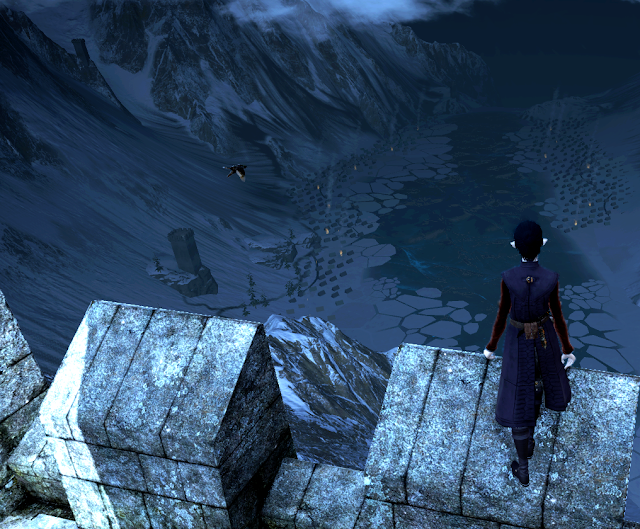 What secrets of Skyhold do you wish you could unravel? I'd love your ideas and input on anything I got wrong here, or whatever I can add that would be helpful... let me know! And thanks as always for reading! NOTE: Ma serannas, readers (Christina, Erica Nichole, Joy M., and Lady Iolanthe)! Thanks to your eagle-eyed feedback, I've updated the Main Floor Map to include the original Surgeon location (near the Tents), as well as adding the Prison to the Vault Map. Please let me know if you see anything else! This is so cool, Angela! Thank you so much for taking the time to create this resource. I am definitely bookmarking it for reference. Quick question--I see that the door to the prison is located under the garden...I would assume the cells are located directly under the garden on the vault level, then? I know they overlook the massive drop-off on the back of the mountain. I always have a hard time orienting them in my mind! Christina, thank you so much for noticing that! I so appreciate it. 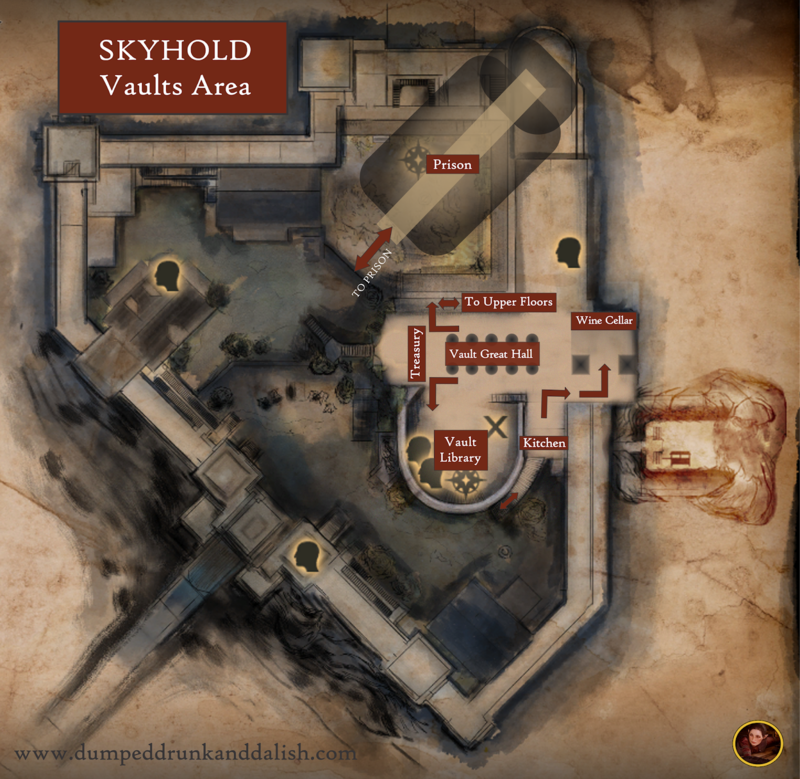 I have updated the Vault Map to roughly approximate the Prison area under Skyhold, and hope that it helps. Please let me know if you see anything else -- and thanks for reading (and commenting)! On the bathroom issue, I always assumed they just used chamber pots. Being a castle, it wouldn't exactly be convenient if they only had one privy somewhere and most of the residents had to trek across the castle whenever they needed to go. And they do have a staff that handles all of the cleaning and whatnot. Also, since when is there a treasury room in Skyhold????? I've played the game several times now and never knew this! I thought that lower room only had that library and the wine cellar! I'm so glad it was helpful! I agree as far as the privies go (although I do think there would be designated areas, and given the level of post-Medieval tech, it actually wouldn't be unusual for Skyhold to have some rudimentary plumbing and even running water. As there's a well outside, I'd also love to headcanon that there might be a magical way of creating a sort of self-renewing hot spring that could be used for that. As Lady Iolanthe noted, meanwhile, you can access the Vault (which is otherwise closed off on the other side of the Wine Cellar) if you have the Elite Clientele perk from Josie. I think you probably know that most of the army isn't in Skyhold - you see their carefully laid-out tents when you look down into the valley from the battlements. There's a particular spot along the battlements where you can interact with a crenellation to get a codex or note-style comment about the encampment from Ser Draman, Ser Morris' assistant. It's on the central battlement above the bridge. But it would be interesting to know whose rooms those are that we can explore but which are always vacant, I agree! Lady Iolanthe, thank you so much! I have somehow missed that view so am going to revisit the battlements to see if I can catch that view of the tents! These would be outside the courtyards, right? 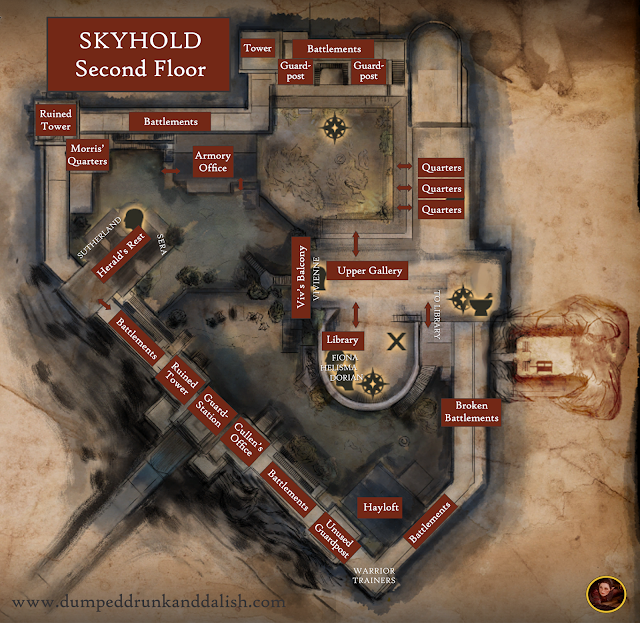 I also do think there's obviously more to Skyhold than what we see -- there are other doors and areas we aren't able to open or access at all (for instance, off the courtyard), so I definitely headcanon that there's plenty of room for the Inquisition people, refugees, and political leaders or dignitaries. I love that we can see little details about those unoccupied rooms -- for instance, there's a beautiful bow on the dresser of (I believe) the one in the middle. What's interesting is that we had a far more concrete view of where everyone slept in Haven. They were all near their quarters or literally right outside their own tents. PS -- Lady Iolanthe, also, I am going to update this post with that info (and hopefully a screen shot) and will credit you -- thank you so much! I live for these kinds of details. I should add that Ser Draman's comments about the army's encampment change over the course of the game as well, as an added detail. For example, after you've defeated Corypheus, the note says that some of the soldiers will stay, but most will probably go home. 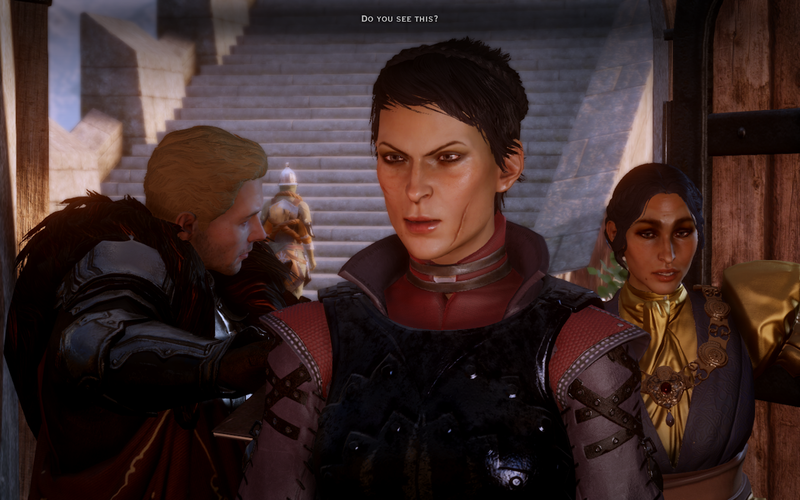 :) Earlier in the game it has other things to say about people arriving to join the Inquisition, etc. Thank you for this! I didn't know this, and have had so much fun going through those Codices. It's a wonderful additional detail. Here is my goofy mystery... daft as this is, I always have my Inquisitor running around to figure out where (which side of the fortress) that amazing waterfall comes out? I can never quite decide. Like you, Angela, as often and as much as I've played DAI, I forget little details and have to go back in just to answer the question (in my case, it is just to chill my mind! xD). I sincerely appreciate how you give kudos to the designers of this...because wow! I love the experience of visiting the many nooks and crannies of Skyhold. And what a cool idea to liken it to the tardis! Oh! another mystery to me is about that door opening into the tower (that I call Inky's Tower), on the other side of the scaffolding...and the opening across from it. Where are these doors and the rooms of that tower? I may not have read closely enough, you may have referred to this. Will go back and reread. For immersion, I chase these details around in game because, I want to visualise the location of my amazing support groups there at the fortress. Always BIG Kudos to YOU! Love how you bring this game to life with your shares. Hi Cosmo, thank you for such a thoughtful and wonderful comment! I so appreciate your reading and taking the time to share your thoughts. On the Undercroft waterfall, I added the Undercroft layer to this map, and feel like what we see on the far Eastern side of the Undercoft is where the waterfall is in relation to the Keep. I love that you bring up those doors we can't get to, especially the many in the Inky's tower! They're so tantalizing! For me, I headcanon that many of these do become available/accessible later on, and that they may be where visiting dignitaries may stay. And thank you so much -- you totally made my day here. This is awesome, Angela! I'd make two corrections, though. The treasury you access with the perk is actually at the other end of that hall, behind the huge painting on the wall between the basement library and the stairs. Once you do the required steps to access it, the painting disappears to reveal the gold. Also, Sera and Cole are both on the side of Herald's rest that faces the courtyard, on separate floors - Cole is on the third floor of the tavern with Sera just below him. You can see Cassandra through her windows. I always imagine my Inky advising Josie and or Cullen to put some of the idle soldiers to work removing debris and repairing towers to make them habitable. It drives me nuts that they fix up so much of it and leave the rest to just sit while there are people crouching throughout the castle picking at the dirt or just standing there. Those towers could make great barracks or visitor quarters. I also head canon that the ruined tower on the top left corner, along with the "patio" (for lack of a better word) below where you meet Hawke, are turned into an Inner Circle hang-out, for private relaxation or late night card games or whatever. I also head-canon that there's a hidden door leading from the garden either into Josie's office or the War Room hallway, just because I want one there (ha). It's obvious there are parts we can't see or access when you look down in the entry leading up to the Inky's quarters. There are doorways and stairways that seem to lead outside or into other parts of the castle, plus there's also a door in the garden, next to the atrium, behind Morrigan that doesn't open...where does it lead? I head canon (I have an active one!) that there are more guest quarters down there for visiting diplomats. I love having a place to talk about these things and love that you posted this, Angela! Thank you! Such GREAT corrections! I can't believe I put Cole on the wrong floor! And thank you for fixing the Treasury location -- you're a godsend! I love your idea of a hidden entrance to the Garden -- I headcanon so many of those things, too! I also have a headcanon that the companions turn one of the third-floor tower rooms into a conference space so that, beyond the War Table, they have a larger (and airier) space in which to sit and meet and discuss events and strategies. I absolutely agree with you about those tantalizing locked doors off the Garden. I think it's so much fun that we can't open ALL the doors or see ALL the quarters... it leaves a little imagination and mystery for us. Meanwhile, thank you so much for commenting and posting -- I so appreciate it, and will look forward to your additional thoughts going forward. Love this so much!! I just found your website a few days ago and already have read every.single. solas post. But I digress- I have a relevant thought. Remember the scene where the whole party is playing cards and Cullen ends up naked? I think or someone else says something along the lines that he has to "run to the barracks" which was puzzling to me. are we sure that the room above his office is his quarters?I know he gets it on up there if romanced but he doesn't seem the type to sleep in a room with a whole in the ceiling. Maybe it's his quarters above his office but he sleeps in the barracks?? Caryn, thanks so much for reading! I'm so glad you enjoyed the posts (and I'm so delighted you've been reading my Solas analyses, too). My take on Cullen's comment there is that the troops in the tented barracks in the valley off to the West are in regular rotation, and so are their commanders. This would also apply to Cullen, so that even if he's at Skyhold that evening, he's going to ride back down and sleep in the tent because it's his turn to command the men there for a few days. Alternatively, he may be running back down to the barracks at Skyhold itself, for similar (duty-related) reasons.